Happy Labor Day, everyone! And more importantly (at least in this house), happy belated birthday to my sweet baby girl, who turned 4 yesterday! More on that later this week. Right now, it’s down to SRC business. My assignment this month was Mellissa’s blog, A Fit and Spicy Life. I wasn’t familiar with her blog before this month, so I took a good look around to see what I had to choose from. I also noticed that she just got married! What a special time for her. I chose this dish because it looked really good, plus I had pork chops ready to go. They were delicious and perfect for a quick and easy weeknight meal. Another great find, thanks to SRC. Thanks, Mellissa! Season pork on both sides with salt and pepper. Heat oil and butter in a large skillet over medium heat. Add pork and cook until browned, about 3-4 minutes per side (depending on thickness of chop). Plate and cover loosely with foil to keep warm. Add onion to skillet and cook until softened. Add sage, thyme and wine. Simmer until sauce reduces down to about 1/3 cup. Stir in any juices in plate. Drizzle sauce on top of pork and serve. This entry was posted in main dishes, pork, QuickAndEasy. Bookmark the permalink. Mmm, another pork chop recipe for me to try!! Great pic and Happy belated birthday Bella!! I made the move from Group C to Group A starting this month, and I was so happy to try your Bruschetta Chicken! We LOVED it…it’s going to be a part of my dinner rotation from here on out. So glad to be in SRC Group A with you!! I’m saving this recipe. 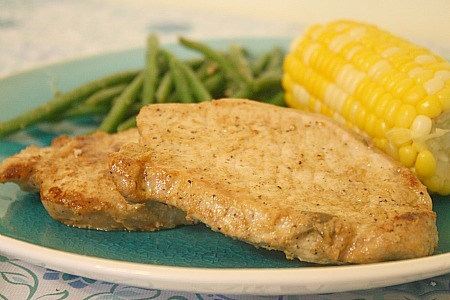 I am always looking for new ways to make pork chops and this looks quick, easy, and delicious. Pork chops are always a hit in our home and I’m always on the lookout for new ways to prepare them so saving this recipe, looks delish! Thanks too for checking out my SRC entry: Fried Green Tomatoes, I appreciate the comment. So glad you liked this! It’s always a hit at my house. This Iowa girl loves a porkchop! And sage is perfect! Mmm, those look good. Dinner at your house! Perfect meal! I can see this fitting right into our regular meal rotation. Those are some great looking pork chops. Sage is always a favorite flavor in the fall. Mmm I love the herbs here. Delicious. Congrats on the FoodBuzz top 9! These pork chops look delicious!